We are a very friendly all-age group, led by the Rev. Mark McCaghrey, assisted by the Rev. Sally Thurgill, and we would love to see you at any of our services. 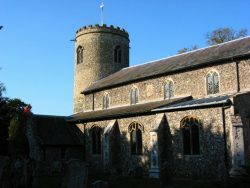 St. Peter's Church, Yaxham is at the end of Church Lane. The building is a small but charming medieval round-tower church with stonework from the Saxon period (a very small amount) right on to the Perpendicular period (14th-15th C), and is usually open during daylight hours. Many Church members are also members of various organisations and are seen as Christian seeds within them - including Governors of the village primary school, Yaxham CofE VA Primary School. 4th Sunday, 10.45am, "Sunday Special"